The different build materials aside, the Samsung Galaxy S II Plus keeps the same dimensions as the original, including the assertively slim profile we're quite fond of. At 125.3 x 66.1 x 8.5mm, it doesn't have the smallest footprint in the 4.3" league, but it's a slim handset that's pretty comfortable to handle and easy to pocket. The NFC version is a tad thicker at 8.9mm, but it's still perfectly manageable. Going Plus has caused the Galaxy S II to gain some weight though. The I9105 tips the scales at 121g, compared to 116g for the classic I9100 version, but that kind of difference is nearly impossible to feel even if you have both in hand. The Samsung Galaxy S II Plus design is a pretty strong reference to its standing in the pecking order. You get the Galaxy S II design with the Galaxy S III finish and the result is surprisingly good. The problem is we were quite fond of the rough textured battery cover of the original and we still prefer it over the new thing. And while looks are strictly a matter of personal preference, the grip and the fingerprint-resistance are not. The Galaxy S II Plus back gets covered in smudges head-to-toe in no time and feels pretty slippery, compared to the grippy and fingerprint-proof back of the I9100. In fact, if we were to redesign the Galaxy S II, we'd only replace the silver frame around the screen, which worst signs of wear, particularly if you are not too careful with the handset. Samsung, however, felt this is the only element worth keeping. It did change the color, so maybe its finish is more durable now, but only time will tell. 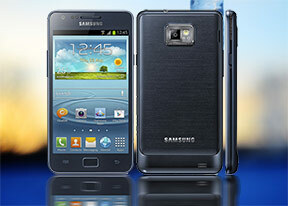 The Samsung Galaxy S II Plus uses the same 4.3" SuperAMOLED Plus screen as the original Galaxy S II. This means you can count on excellent viewing angles, sky-high contrast and reasonable brightness levels. The WVGA resolution stretches a bit thin on the 4.3" display, making for a pixel density of just 217ppi, but it's by no means too bad to look at. Of course, those 720p and 1080p monsters of a screen look way sharper, but this one is pretty crisp, too. And because it uses a traditional RGB matrix instead of PenTile, there's no need to worry about the crosshatch pattern either. Overall, the display is good, though nowhere near as impressive as it was when the Galaxy S II launched.